On Second Scoop: Ice Cream Reviews: Our Very First Trip to Sonic! Our Very First Trip to Sonic! That's right, we finally made it to Sonic! I know it was July, but remember the Sonic prizes I got to hand out? Well, included in all the wonderful hub bub was a gift card for me too, problem was, there's only one in the state, and it's well over an hour away. Looks pretty high tech doesn't it? It's pretty simple. 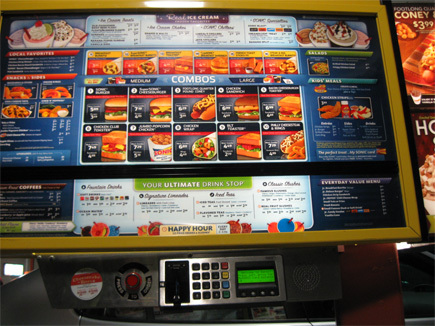 You peruse the menu, press the red button to get started, and then wait a short time for someone to take your order. When you are done, you can swipe your credit (or gift) card and pay for your meal, or just wait for your server to bring your food and then pay in cash. Ok, enough technical stuff, let's talk food. My original plan was to just have ice cream, but we were starved from walking around the museum, so we went with dinner first. My daughter went with a "wacky pack", also known as a kids meal (website coming soon). She picked a plain cheeseburger and apple slices (as she usually does at a fast food joint). My wife was excited by the fact that you can order breakfast all day long and so decided to go with a breakfast burrito and tater tots. I should have tried something daring like the bacon toaster club but I didn't want to fill up, so I too went with a plain cheeseburger (what can I say, you test the basics and then move forward). Now I wanted to work in as much frozen goodness as possible, so we got creative. Even though I don't ever really drink limeade, I tried it anyway after a recommendation from my bud. My wife went with a real fruit strawberry slush. So, at this point (between 3 adults and 2 kids meals) we were half way through the $50 gift card, so now it was time to get creative. Actually, we could have easily driven home at this point since we had all had enough to eat, but like I said, we were over an hour from home and we pretty much never come out this way. Ok, here is the game plan, everyone gets something different. My wife steps up first and picks a small strawberry milkshake. My daughter chimes in from the back and would like an Oreo blizzard, oops, sorry, typo I swear. My daughter would like an Oreo Sonic Blast (one of 5 available flavors). Hmmm, but what about me? Tough call really, we need to head home but I need something different. Actually, now is a great time to lodge a complaint here. On the right side of the menu is ad for two seasonal treats: Holiday Spiced Sugar Cookie Blast and Holiday Spiced Hot Chocolate. The problem is that in putting the two next to each other, I can't really tell what the cookie blast is. Is it a drink or is it ice cream? It was very frustrating looking at a treat with absolutely no description on it, plus it has whip cream on top, so you can't tell what's underneath. Yes yes, I could have asked, but honestly, I shouldn't have to. The worst part is that now that I'm home, I just looked at the description: "the new Holiday Spiced Sugar Cookie Blast made with spiced caramel real ice cream, sweet sugar cookie pieces and whipped topping" That sounds awesome and I'm kicking myself for not trying it. Back to our story now. 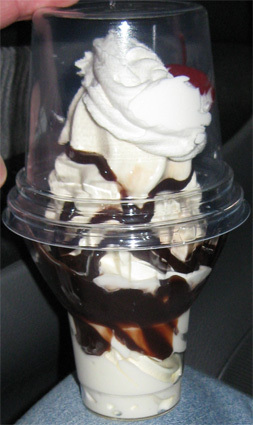 I decided to go with a hot fudge sundae. No, it's not crazy or exciting or anything like that, but so far our meal has been fairly average and unremarkable. I'm not saying bad, I'm saying it's nothing special yet. My daughter is happy with her sonic blast, though I wish I had taken a better look at it to see how it was blended. My wife's strawberry shake was spot on and really good. It had a good, strong sweet strawberry taste and a fairly but not really thick consistency (as in you have to try, but not too hard, to get it up the straw). Wait, the waitress is coming out one more time! You see, I snuck in one more treat! See, we got a little flyer with our initial dinner order talking about limited time only Cheesecake Bites!! Now my wife adores cheesecake, so it just seemed wrong to leave without them. Hmmm, 3 for $2.99 or 5 for $3.99? Doesn't sound like much, so let's go with five. ...and these things are awesome! man o man! They are a good size and basically they are sweet liquid cheesecake goodness in an unhealthy fried shell. Due to my own cheesecake bias, and then adding that smell, I was sure I wouldn't like these but man are they good. My wife snags one and is in full agreement. What a cool (and probably horribly unhealthy) snack. I couldn't justify the health cost all the time, but it's definitely something you need to try. Note-1: we forgot to try the caramel dipping sauce. Note-2: My wife tried reheating the 3 that were leftover but it didn't go real well. Home at last and now Sonic has conquered the roof of my car. Incase you are curious, we have from left to right: my sundae, the small shake, the reg slush in the middle (same size as the limeade), the reg sonic blast, and then the kids meal drink. 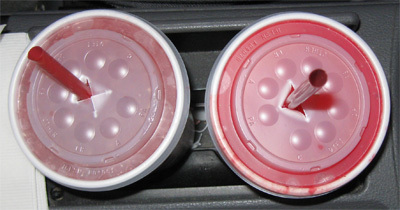 If you are are a tree hugger (like me), then you probably won't be happy to hear that all of the white containers are styrofoam and not paper... but in Sonic's defense, the slush was still cold by the time we got home. I'm glad we finally made it, I guess the big downside is that after so many years of waiting (at least 3 years, if not more), well, there was no way for Sonic to truly live up to the hype, especially when mistakes were made on my part... though in my defense this was the first time we've tried something like this. I guess I'm glad I only waited a few minutes for my food, rather than some crazy hour like when the store first opened. Final Verdict: Nice, but not crazy 11 out of 10 cool like I set up in my mind. Just a remind: This review was sponsored by Sonic, big thanks to them! Allergen note: Products containing peanuts, fish, eggs, milk, soy, wheat, tree nuts, shellfish etc are used in this restaurant and may come in contact with your food or drink. The holiday cookie blast is indeed wonderful. It has a gingerbread tinge to it and the cookie bites are still firm as you work your way through. I usually eat 1/2 and freeze the rest for the next day and the cookies were still firm on the second day. I loved it. Sonic freezes well? That's cool! DQ gets pretty funky if you try freezing it. 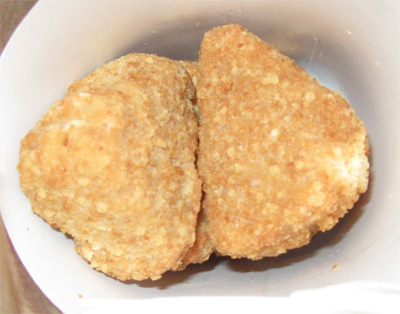 those cheesecake bites look almost too much life chicken mcnuggets to me, so i was a bit surprised to read you say they tasted good. unfortunately, i don't believe there's a sonic's near me to find out for myself.